Truck People? Yes. People Business? Definitely. Our philosophy is simple: Treat everyone the way we would like to be treated. This principle guides our team whether we’re interacting with one another or serving you, our customer. It’s how we’re able to offer you the exceptional value that we do – dependable vehicles at fair prices with superb service. It’s also why we have the most satisfied customers in the industry. We hope you’ll become one of them. The Superior Quality You Deserve: We hand-pick our inventory – selecting the best, most desired vehicles from among auctions, dealers and private sellers. We then take great care to recondition each vehicle according to the highest standards. The end product: a great-looking vehicle that performs at or beyond your expectations. 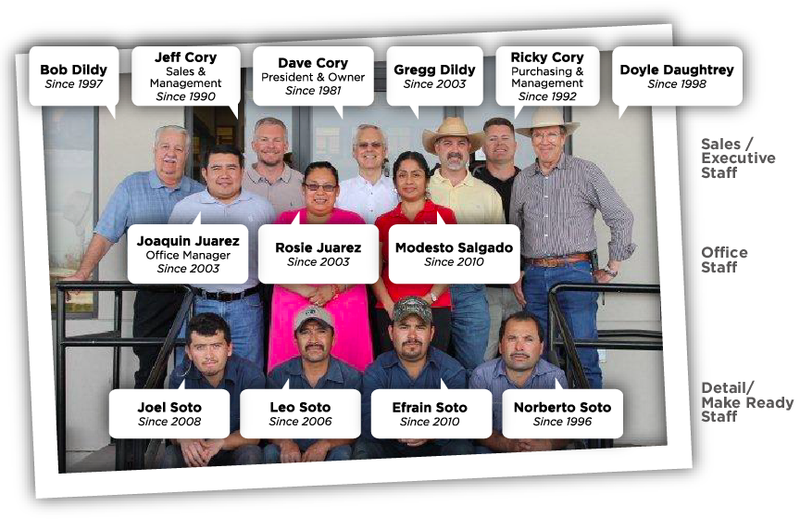 A Hard-Working Company You Can Rely On: After a successful career in sales, management and ownership with Ford, Dave Cory opened Dave Cory Motors in 1981. His goal: to always have the best reputation of any used vehicle dealer anywhere. Since then, the company has continued to grow — thanks to our ongoing commitment to hard work, excellence and people. In the process, we’ve become known for delivering hard-working trucks and vans that drive your business. An Experienced Team You Can Trust: When you turn to Dave Cory Motors, you’re getting more than a truck. You’re getting our people. And we believe they’re some of the best, brightest and hard-working in the industry. They're also a part of our family, where everyone is valued, cared for and treated with respect. That’s why we have the longest-tenured staff in the industry. Get The Hardest Working Vehicle at the Best Price!